NEW YORK, Nov. 20, 2018 /PRNewswire/ -- Concierge Auctions has announced its lineup of 18 premier properties for its second-annual December Sale in partnership with media powerhouses The Wall Street Journal and Mansion Global, featuring a selection of the world's finest real estate offerings. Bidding for the unique offerings, the majority of which will sell Without Reserve, will open digitally December 14th (US) and close at a live auction in Hong Kong on December 20th (December 19th US). While the sale is particularly targeting Chinese real estate investors, prospective buyers may bid from anywhere in the world via the firm's global online marketplace, ConciergeAuctions.com. Concierge Auctions will begin sales efforts next week with a series of custom launch events in Guangzhou and Hong Kong from November 27-29th, hosted in partnership with Mansion Global, with additional outreach to high-net-worth Chinese clientele within the Dow Jones network. Concierge Auctions will also attend the Juwai China Agent Summit on December 5th and sponsor the Luxury Property Showcase (LPS) on December 7th–9th, the leading invitation-only luxury property show in China with an expected audience of more than 12,000 Chinese home buyers and VIPs. Both events are in Shanghai. 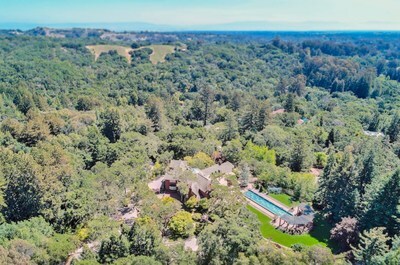 Located in the Bay Area's exclusive community of Woodside, 700 Kings Mountain Road is a gated architectural masterpiece with smart home features and direct access to the 1,000-acre Huddart Park. The custom-built, four-bedroom home boasts American-made materials and craftmanship, and features marble floors and soaring ceilings including a two-story rotunda with a massive skylight. Comprised of 12,000 square feet, the estate also offers four master sanctuaries with custom closets and dressing rooms, spa baths, walk-in showers and a jetted tub; a chef's kitchen with two large islands and pantries, custom cabinetry, and garden views; a 13,000-bottle wine cellar and tasting room; elevator; wood-paneled office/library; wet bar and lounge; theater room; gym; and an attached three-car garage. Outdoor features include a 1,000-square-foot guest house equipped with four additional parking spaces, a swimming pool, fountain, gazebo, covered and open terraces, and award-winning landscaping with flowering plum trees. Previously listed for $17.999 million, the property will sell Without Reserve in cooperation with Kimberly Connor of Intero, a Berkshire Hathaway Affiliate. Set on more than 10 acres with nearly 500 feet of shoreline along the Colleton River, 28 Seven Oaks Drive is a 20,700-square-foot waterfront chateau located in the prestigious Colleton River Club. The six-bedroom estate features unique details such as a music room with 1830s paneling originally from the Hungarian Embassy in Paris; a tea room with a leaded glass ceiling from an old New York hotel; and a hand-carved mahogany mantle crafted over the span of two years. The home also offers a great room and library; six gourmet kitchens; beautiful "groin" ceiling; a dining room with seating for up to 28 guests; a courtyard with outdoor fireplace and fountains; two guest suites/maid's quarters; a guest cottage with an additional three bedrooms; a pool with spa, waterfall and poolside cabana; and a private deep-water dock. The coastal community features two nationally-acclaimed championship golf courses — one designed in 1991 by the legendary Jack Nicklaus, and the second designed in 1998 by World Golf Hall of Fame architect, Pete Dye. Hilton Head Island also offers 12 miles of world-renowned beaches, hundreds of tennis courts, and a variety of fine dining options. Previously listed for $9 million, the estate will sell Without Reserve in cooperation with Linda Rudd of Engel & Völkers. Ideally located at 74 Avenue Marceau and 4 Rue Lincoln within The Golden Triangle in Paris, two unique apartments will sell separately At or Above €5.85 million and €4.25 million, respectively. Designed by world-renowned artist Gérard Faivre, both residences feature contemporary designs and are completely turn-key, providing the unique concept of luxury, hassle-free living. Initially listed for €7.3 million, 74 Avenue Marceau is a three-bedroom apartment located just 150 metres from the landmarks of Place de l'Etoile and the Arc de Triomphe. Comprised of a total of 272 square metres (2,928 square feet), the apartment occupies the entire third floor and boasts original parquet flooring, full-height internal double doors, ceiling cornicing, marble fireplaces, and wood paneling. Separately, Apartment Francois 1er at 4 Rue Lincoln was initially listed for €5.4 million and is situated 300 metres from the Champs Élysées. Comprised of 204 square metres (2,196 square feet), the apartment takes up the majestic "piano nobile" floor of the historic building and offers two bedroom suites, several living/entertaining rooms, and a balcony with views of the Champs Élysées. Both apartment buildings include a 24-hour caretaker and access to a private concierge service, and will sell in cooperation with Cyrille Faivre, the exclusive listing agent for all properties within the Gérard Faivre portfolio. "Our offer is very different from traditional developers and interior designers. It is an alternative that responds to the demands of international clients wishing to have as few concerns as possible," stated Faivre. Previously awarded HGTV's "Ultimate House Hunt" by over one million voters, 72-3170 Alapii Kula Drive — located within the private enclave of Kuki'o on Hawaii's Big Island — is the pinnacle of indoor-outdoor living. Originally listed for $7.2 million, the oasis offers five bedrooms; glass walls opening to the outdoor patio; a chef's kitchen; great room; master retreat with an open-air master bath; home office; two guest houses with indoor-outdoor baths; and a fourth structure with a three-car garage and a temperature-regulated, walk-in wine cellar. The property's outdoor features include a covered outdoor wet bar; large lanai with Sunbrite TV; outdoor kitchen and lounge; swimming pool and hot tub; and unobstructed mountain and ocean views. The property is located in the exclusive Kuki'o Golf and Beach Club, providing residents with access to a full-service Member's Clubhouse; extensive spa and fitness facilities; two dining restaurants and bar; a signature Outdoor Pursuits Ocean Sports program; a Tom Fazio-designed, 10-hole short golf course; and an 18-hole championship golf course. "Kuki'o is a magical community providing views extending from Kua Bay to Kuki'o Bay, where whales, dolphins, and sea turtles can be readily visible from your stand up paddle board or outrigger canoe," stated the seller, Denise Farleigh. "The property itself is a private oasis, allowing for a luxurious lifestyle with its extensive lanais for seamless, year-round indoor/outdoor living and its unobstructed, 360-degree views featuring sunrise views over Hualalai Mountain and sunset views over the ocean. Residents within the community also have access to the golf and beach clubhouses, each containing gourmet restaurants, extensive workout facilities with daily fitness classes, and other world-class amenities." The contemporary estate will sell furnished Without Reserve in cooperation with Carrie Nicholson of Hawaii Life Real Estate Brokers. "What I love most about this property is its contemporary architectural design and indoor/outdoor living areas," stated Nicholson. "Not only does it have sweeping ocean & coastline views, but it's also located in the premier private Golf and Beach Club Community of Kuki'o, offering world class amenities, exclusivity and privacy, all within a tranquil Hawaiian setting. Some of the most beautiful and pristine white sand beaches are within close proximity, ideal for swimming and enjoying many outdoor activities." In cooperation with Chris Bradley of Royal LePage Northstar Realty. Previously Listed for $19.888 million CAD. Selling At or Above $10.9 million CAD. In cooperation with Linda Afman of RE/MAX 4000. Currently Listed for $1.695 million. Selling Without Reserve. In cooperation with Paul Handle and Peter Mahler of Mahler Sotheby's International Realty. Previously Listed for $2.2 million and $2.9 million, respectively. Selling Separately Without Reserve. In cooperation with Leila Maria La Touche of Terra Caribbean. Previously Listed for $4 million. Selling Without Reserve. In cooperation with Todd Cutter and Steve Hooven of 2Costa Rica Real Estate. Previously Listed for $4.95 million. Selling Without Reserve. In cooperation with Alison Howell of Compass RE Texas. Previously Listed for $5.95 million. Selling Without Reserve. In cooperation with Wendie Steffens of Kurfiss Sotheby's International Realty. Currently Listed for $3.76 million. Selling Without Reserve. In cooperation with Chris Foster of John Daugherty Realtors Inc. Previously Listed for $4.5 million. Selling Without Reserve. In cooperation with Richard Young of Young Estates. Previously Listed for $6.12 million. Selling Without Reserve. In cooperation with Mark Wiens of Mark Wiens Personal Real Estate Corporation. Currently Listed for $3.67 million CAD. Selling Without Reserve. In cooperation with Jody Lovell of Highlands Sotheby's International Realty. Currently Listed for $1.495 million. Selling Without Reserve. In cooperation with Gerard Bisignano of Vista Sotheby's International Realty. Previously Listed for $15.45 million. Selling Without Reserve. Located in a secluded corner of Mexico's Riviera Maya, the Mukan Resort is the only five-star, eco-friendly property on the Sian Ka'an Biosphere Reserve, a UNESCO World Heritage Site at the Mesoamerican Barrier Reef. Currently listed for $8.5 million, the 10-bedroom estate featuring a main house, five private en-suite guest bungalows and on-site staff quarters will sell Without Reserve in cooperation with Charley Ford of LIV Sotheby's International Realty. "The timeless Mukan Resort is the epitome of remote opulence, providing a world-class experience for even the most discerning traveler. Located within a secluded corner of Riviera Maya, the private resort is equipped with amenities for all — from the personalized, concierge services for the elite traveler to the watersport activities in the Caribbean Ocean for the adventure seeker," stated Ford. "The upcoming auction is a once-in-a-lifetime opportunity for someone to own this self-sustaining retreat within a protected UNESCO nature preserve, for use as a private family retreat or as a business." The sustainable resort offers energy and water purification systems; a self-perpetuating underground cistern; a wind turbine; chef's garden; private-grid WiFi; and an on-site electricity grid with solar, eolic, and backup generator power. Architectural features include a palapa roof, vaulted ceilings, walls of retractable sliding doors and handmade furniture from local artisans. Outdoor living features include a rooftop terrace with plunge pool, private bungalow pools, wraparound decks and outdoor dining areas. The resort is remote, yet still connected to the outside world and can be used as a private family compound, or provide additional income as a business. "In Mayan, Sian Ka'an means 'origin of the sky,' where you can experience and become one with some of the most preserved and protected areas on earth," stated Jonathan Blue, Chairman of Blue Equity, de Mexico, S.A., the developer of the property. "We picked this location and constructed this property with a vision to blend in with paradise — from the moment you arrive at the dock on the lagoon to when you indulge in delectable fresh local cuisine, walk on pure white sand beaches away from mass tourist areas, experience the beauty of animals and other wildlife in their natural habitat, and gaze at the stars at night, all while never having to disconnect from the rest of the world. We have created a special place to experience the area and all of its surroundings while maintaining a five-star luxury experience." In cooperation with Deborah Greenspan of Pacific Sotheby's International Realty. Originally Listed for $9.2 million. Selling Without Reserve. In cooperation with Kathleen D. Farrar of Windermere Real Estate Co. Previously Listed for $4.25 million. Selling Without Reserve. In cooperation with Anna Marie Stephens and Barbara Alexander of Howard Hanna Premier Properties. Previously Listed for $3.8 million. Selling Without Reserve. In cooperation with Andrea DiPilato of Preferred Properties Real Estate of New Jersey. Previously Listed for $3.95 million. Selling Without Reserve. In cooperation with Brian Thomas and Rick Langevin of Surterre Properties. Previously Listed for $14.95 million. No Minimum Bid. In cooperation with Jean Merkelbach of Engel & Völkers. Previously Listed for $2.6 million. Selling At or Above $675,000. In cooperation with Julie Rohr and Walt Danley of Walt Danley Christie's International Real Estate. Previously Listed for $9.5 million. Selling Without Reserve. In cooperation with Darlene Letersky of Coldwell Banker Residential Brokerage. Previously Listed for $1.895 million. Selling Without Reserve. In cooperation with Mark Weinreich of Berkshire Hathaway Homeservices Colorado Properties. To view all properties in Concierge Auctions' December Sale, visit https://www.conciergeauctions.com/collection/december-2018-china-portfolio.